It’s got a bit of a buzz these days doesn’t it? It seems every technology provider, agency, and consultant promises to help you tell a better story. But what does “telling a better story” even mean? To tell a better story, do marketers need to be edgier and differentiate themselves to an audience numb to everything except the completely outrageous? Maybe. But that ultimately seems like a zero-sum game. How many more over-the-top content ideas do you produce before you jump the proverbial shark? Is BuzzFeed, with all its cat-video and which-Game-of-Thrones-character-are-you-quiz “trending buzz,” a huge success? Or, is it failing to differentiate? And, the way things are going lately, today’s mainstream news headlines are probably going to be more outrageous than your brand ever will anyway. Does “telling a better story” mean you just need to put more and more detail into your content? Give away all the thinking and bombard your audience with so much quality and detailed facts that they must appreciate the sheer amount of content (#AllTheEducation)? If the last 24 months of the daily news cycle haven’t illustrated this “truth” in spades, I’m not sure what will. Put simply: A great story is a well-crafted, entertaining, engaging, and (ultimately) convincing argument. With a fulfilling story, if I’m successful as an author, I’ve taken you on a journey and you believe (or are at least open to believing) something different at the end of it. A great story takes you on a journey where you believe something different at the end, says @Robert_Rose. This is something you as a marketer can test as you create your content. I’ve worked with hundreds of marketing professionals and storytellers over the last 10 years. I’ve employed and customized a number of borrowed “tools” to help them get to better stories. 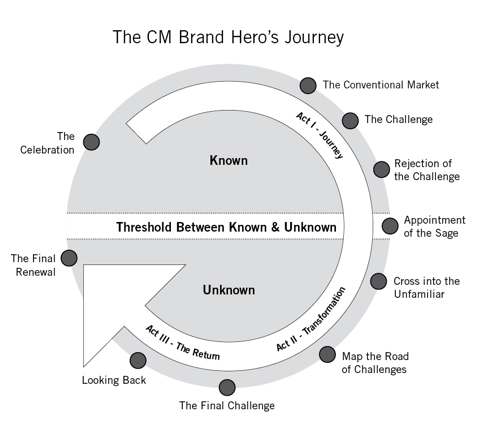 If you read my first book, Managing Content Marketing, written with my colleague Joe Pulizzi, you might remember how we used a modified version of Joseph Campbell’s Hero’s Journey to help structure what we called the Brand Hero’s Journey. If you read my book with Carla Johnson, Experiences: The 7th Era of Marketing, you might remember we’ve used the classic “5 why’s” as a means of helping content marketers get to a deeper, more meaningful story. While I still use both approaches in coaching and in the content creation process, I recently found another approach that helps marketers pressure test a story to see if it has all the components that make it a good one rather than just an outrageous situation or a collection of facts. With a huge hat tip to my friend and writers’ coach Jeff Lyons and his Anatomy of a Premise Line, I customized a framework that I call the Business Story Argument Framework. Now, the key utility of this framework is to know that it doesn’t write your story nor serve as a template. Its usefulness is in how it can help you pressure test an idea for a story you already have. Getting to a satisfying story can be truly difficult. Add to that the fact that marketers are often pressed for time, and it’s just near impossible to truly settle in and think about how to create a meaningful, engaging, and convincing story that illuminates some greater truth about the world. But if you can pressure test your ideas more quickly, perhaps you can at least improve the chances of focusing only on the best ideas or provide clearer direction for your existing content marketing initiative. Are you ready for the adventure? OK, let’s do it. You may come to an idea for a content marketing story from any number of places. The lightning of an idea may strike you in the shower or while you’re walking the dog. Or you might be inspired by an idea that comes out of your team’s latest brainstorming standup. Or you may inherit a story because your company just acquired a brand that has a digital magazine. The human – Every great story has a human soul at its core, even if that human is a talking Lego character. Nobody wants to hear the story of industrial manufacturing. They want to hear the story of Jane, the enigmatic heroine who finds herself challenged with leading a new industrial manufacturer. The goal – A goal is a conscious or unconscious desire of the human. The desire to achieve a goal is what propels our human hero through the story journey. When the goal is conscious it is related to the greater “truth” (as detailed below). The superhero team’s goal, for example, is to simply defeat the monster. When the goal is unconscious, events transpire in the story that ignite the illuminated truth in our human hero. Think of the classic detective story, where the hero feels she’s getting too old and just wants to solve the last case so she can retire. However, by solving the most difficult case of her career the hero also discovers it’s the work that keeps her young. The best stories have both conscious and unconscious goals. The resistance – Every great story needs a seemingly insurmountable obstacle. Occasionally, this comes in the form of a great human villain petting a white cat in a secret lair. Other times the resistance is simply a “mountain” that must be climbed or a giant shark that must be killed. The bigger the resistance and the more relatable to the hero, the better the story. The truth – The truth is your argument – what you believe in and what you are arguing. Some might call this the “theme” or “message” of the story, but at its core the truth is simply the belief you are trying to inspire in the audience of your story. Now, if you are a fan of Joe’s book Content Inc., you can roughly map these four attributes to what he calls the anatomy of a content mission. Human = core target audience – In most cases your business story’s hero is the audience you are targeting. At a broader storytelling level, your human hero must simply be relatable to your target audience. In every great story, the audience can see themselves in the hero. Goal = what will be delivered – The content must meet the desire of your audience consciously or subconsciously. If it is conscious then you promise what the audience said it desired. If it is subconscious then you either illuminate something previously unknown by your audience or challenge a core belief and work to successfully alter it. Again, the best stories satisfy both conscious and unconscious goals. Resistance = outcome for the audience – As content marketers, you help deliver challenges and adventures for the audience to go through. The bigger the challenges and the more satisfyingly you pull the audience through them – the more satisfying the story and the more convincing the argument. Truth = content tilt. Joe calls his “content tilt” the “sweet spot.” This is the differentiator and should be the greater truth that you illuminate. This is your unique point of view, and ultimately what you want your audience to believe. As Joe points out, entrepreneur Ann Reardon started a blog called How To Cook That. Her truth, or content tilt, is that she believes that “a qualified food scientist and dietician who likes to cook (should teach you to make) ridiculously unhealthy desserts!” He didn’t make that up. It’s the first line of her About Us page. That brings us to Act 2 – the tests and challenges. To get to the four parts of a great story, break down this framework further and pressure test the component elements of your story. I created seven questions to which satisfying answers should be present in your story. Who is your human hero? Identify the person who will be on the journey. What is the hero’s constriction? What is pressing the hero to action? Something in their world is broken and the hero is being pushed or pulled to fix it. What is the hero’s desire? What is the conscious or unconscious desire of our human hero? What relationships can help? What (or who) are the important relationships that will help your human hero move through this adventure? What is the resistance? What is the active resistance to your hero? What seems impossible to overcome? What are the adventures? What are the series of tests and challenges that must be overcome? Have you truly tested your hero? If you have holes in your story – where your audience will disbelieve your argument – it is usually because you haven’t truly tested your hero. What Is the truth? – What is your argument? It may be connected to a conscious desire or the hero may discover the truth through the adventures that transpire. The answers to these questions can be combined to get to your content mission or to pressure test the story you have in mind. Once you have identified answers to the seven components, you can combine them into the four parts of the great story to get to the anatomy of your content mission. To help put this into context, let’s look at an example. Recently, I was privileged to work with an institutional financial services company on a new content mission. It was looking for a new and clearer focus for its digital magazine. The publication was working, but the articles from different parts of the business were becoming broader and less valuable. The team wanted a clearly defined – and differentiating – story for the magazine that they could communicate. We worked through the answers to the seven components and combined them into the four parts of their new story. As you’ll see below, the components are well detailed but certainly not perfect. The team is still working on using this to polish the mission for internal and external audiences. The human (combines the hero and the constriction) – The hero is the financial advisor who is under increasing pressure to perform for clients and to prove expertise and ability to manage money is better than an algorithm. The desire (combines the desire and relationships) – These advisors need and want continuing education. They don’t need more noise; they need unique perspective and guidance from expert portfolio managers, trusted colleagues, and true thought leaders in the industry to remain relevant to their clients. The resistance (combines resistance and adventures) – The advisor’s world is in danger of becoming automated by algorithms and artificial intelligence. It’s an atmosphere that increasingly devalues the human investor. Time is pressure. Today’s advisor must get to deeper meaning, perspective, and the long view as quickly as possible. The truth. Human investing is the only investing. It is a higher calling. And once the advisor has this ability, he can not only deliver the long-term value for clients, the advisor can deliver sustainability in his career. Can’t you see better stories, better posts, and overall a differentiated value coming from that framework? Remember, the framework and how you construct it isn’t itself meant to be the mission. It’s meant to help you convey the mission. You can use the four parts of your great story as the anatomy of a wonderful and differentiated argument, the heart of a great business story. In other words, not every great story will have some earth-shattering, differentiating answer to every question. But the better the answers, the better chance you have something truly worth exploring. So, the framework can be a tool of expedience; getting to a better story more quickly. Or over a longer time, the framework might help you develop a bigger and better story where none existed. Overall, I just hope it becomes another tool in your skill box, helping you to become an amazing storyteller in a world that will increasingly value that talent. Discover more systematic frameworks and processes to help your content marketing program’s success at Intelligent Content Conference. Reserve your spot for the March 20-22 event in Las Vegas. Use code BLOG100 to save $100. 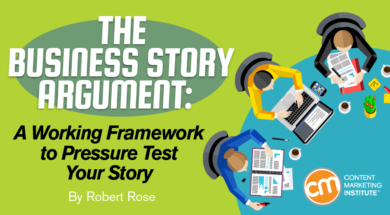 The post The Business Story Argument: A Working Framework to Pressure Test Your Story appeared first on Content Marketing Institute.